MANILA, Philippines - Members of Korean boy band Big Bang have left a big mark on the hearts of Pinoy fans after their successful concert at the Mall of Asia Arena last Oct. 24. Despite that a typhoon was threatening to ruin the big day, the arena was full and the deafening screams filled the concert venue from start to encore. By noon of Oct. 24, Pinoy VIPs (name for Big Bang fans) were already outside the Mall of Asia Arena. Bulletin Entertainment asked fans about their fond memories of the Big Bang concert. Angie Rivera from San Pedro, Laguna, said she enjoyed the concert so much. "I enjoyed the concert and there were no dull moments. The members were so good-looking with nice bodies. The audience were all excited to see them sing and dance. My favorite moments were when they made the crowd participate when they sang and rapped, and most especially when they talked in English," she said. Karen Brizuela, 19, of Manila, described the concert as perfect. "If there's one word that could define how the concert went, it's PERFECTION. They exceeded my expectations for being so good in performing live," she said. She said that her memorable part was about Taeyang. "It may sound inappropriate but my favorite part in the concert was when Taeyang stripped off his top for the second time until the concert ended. Need not to say how i enjoyed the concert that I even lost my voice the day after," Brizuela added. Emy Rolda from Muntinlupa was particularly impressed with Seungri, saying that the singer was handsome. Filipino fans came to the concert prepared, aiming to show Big Bang their love. They were armed with their Big Bang yellow light sticks and other accessories. Samsung Galaxy, the main sponsor of the world tour, handed out blue bangles to the fans. The concert was impressive from the stage layout , big screens to special lighting effects. The moment the gigantic cover of the main stage was unveiled to reveal Big Bang inside glass capsules, the audience's frenzy started, screaming at the top of their lungs and waving their light sticks. 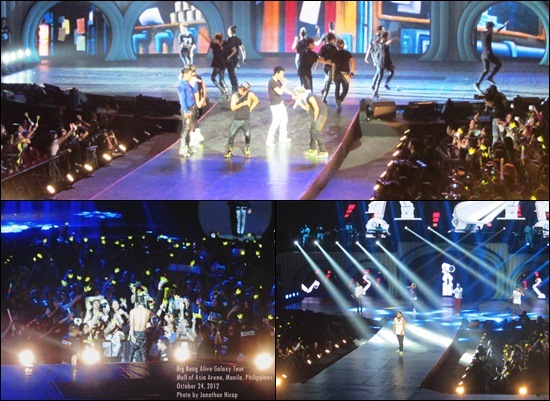 Big Bang performed songs from their albums including "Fantastic Baby," "Tonight," "Blue," "Monster" and "High High." During the concert, Big Bang made sure the night would be memorable for the fans. G-Dragon, for instance, gave away his jacket to the audience. The members also spoke in English and Tagalog including Daesung and TOP's "Mahal ko kayo" lines. There was one incident when a fan threw a bra at TOP, who didn't catch it after realizing what the item was. Taeyang was hyper and full of energy that night. At one point, he performed shirtless and even went near the audience at the VIP section as his fan service. Overall, the fans really had a great time watching the concert, which lasted for more than two hours including the encore. Big Bang members were impressed and thanked the fans who came to watch them. In his diary posted on Big Bang's Japanese mobile site, Seungri expressed his gratitude to Filipino fans. "Today was really great, I'm so surprised! This is our first time doing LIVE in Philippine but the reaction from everyone was so great, I'm surprised. Everyone danced to our music. Countries have their own style, I feel that Philippine was quite calm. And i think the town was a bit quiet..but it was really hot! It was fun! Philippine, Thank you!" he wrote, according to a translation on Twitter by Japanese Big Bang fan @0401rurutic. Justin Bieber And 4Minute's Hyuna As A Couple?